The Battle of Seattle: Is the Seahawks/49ers Rivalry Over? Earl Thomas of the Seattle Seahawks celebrates against the San Francisco 49ers on December 14th, 2014. Standing on the sidelines of CenturyLink Field on Sunday, the cold consumed your body from the feet up, like Han Solo in carbonite. But that was nothing compared to the way the Seattle Seahawks froze out the San Francisco 49ers, pounding their divisional foes 17-7 in a rivalry game rife with subplots. Not only was it Seattle’s third consecutive win over San Francisco – and fifth in the last six meetings – but the loss eliminated the Niners from playoff contention, essentially ending their renaissance under the leadership of Jim Harbaugh, the fiery head coach who has burned his bridges by the Bay and will be departing shortly after the season wraps. In essence, Sunday’s game not only closed the book on both a burgeoning semi-dynasty, but effectively ended one of the NFL’s fiercest rivalries. Like most recent battles between the teams, this one was a brutal, bruising affair. San Francisco led 7-3 at the half, thanks to Frank Gore’s hammering runs and stout defense on Russell Wilson, though with Gore ruled out of the second half with a concussion, Seattle slowly began to take control. When Marshawn Lynch – who rumbled for 91 yards on the day – stomped into the end zone with two minutes left in the third quarter, the Seahawks reclaimed the lead. Wilson added a touchdown pass in the fourth, Seattle’s defense stuffed San Francisco on a late 4th-and-1 (they also sacked Colin Kaepernick six times), and that was that. Game over. Rivalry over. He was right, though one of those wins actually took place in an epic NFC Championship battle back in January, a game decided by the left hand of Richard Sherman. At the time, it seemed as if these two franchises would be competing for the foreseeable future. 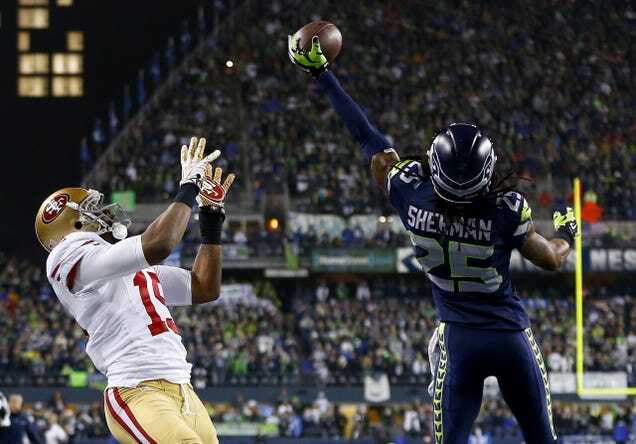 What we didn’t know was that when Sherman swatted away Kaepernick’s pass to Michael Crabtree, he might have also slapped San Francisco back to the basement. Seattle’s only loss to San Fran over their last six meetings was by two points. In the other five games, Pete Carroll’s team has won by 29, 26,16, 10 and 6 points. The Seahawks haven’t given up more than 19 points to the 49ers in any of their last eight games, dating back to Harbaugh’s debut in Week 1 of the 2011 season. They’ve now beaten them on the road, in the playoffs, swept them in a season series and, for the first time in Harbaugh’s pro career, kept them out of the postseason. In what was once known as “The NFC arms race,” it appears that the 49ers are playing with their hands tied behind their backs. But forget, for a moment, the disparity between the two teams. The beef between the franchises began with the rivalry between the men leading them – Harbaugh and Carroll. They paced Pac-12 sidelines in college, at Stanford and USC, respectively, and Harbaugh announced his arrival to the NFL by beating Carroll 33-17 in Week 1 of 2011. He’d do it again at the end of the year, guiding the 49ers to their first division title since 2002…after Seattle had won the NFC West in five of the previous seven seasons. The next year it became apparent that the rivalry was real, and about more than just Harbaugh and Carroll; both teams made the playoffs, split the season series and had exciting young quarterbacks in Wilson and Kaepernick. While San Francisco made the Super Bowl, Seattle fell two points shy of beating the Atlanta Falcons and playing against the 49ers in the NFC Championship Game. They split their regular season meetings again in 2013, and then came Sherman’s play in the NFC title game. Now, Seattle is fighting for a repeat Super Bowl championship, while San Francisco is playing for nothing, for the first – and probably last – time in in Harbaugh’s tenure. And once he leaves, he’ll be taking a major part of the rivalry with him. At the moment, Seattle’s biggest test could come from the resilient Arizona Cardinals, who lead the NFC West at 11-3. The two teams meet next Sunday, with a divisional title – and home-field advantage in the playoffs – on the line. It’s a big game; though, if we’re being honest, it doesn’t feel quite as big as Seahawks/Niners. There’s no history or real acrimony there, though perhaps beggars can’t be choosers. Had San Francisco won on Sunday, they wouldn’t just have kept their playoff hopes alive, they would have also ensured that this rivalry remained significant to the landscape of the entire NFL. But they didn’t. So it’s not. Instead, we must convince ourselves that the Battle of the Birds – ‘Hawks vs. Cards, for nesting rights – is an acceptable substitute. And the fans aren’t the only ones that need to be talked into it. Not as much as we loved watching.